The last year and a half have really sucked. We've felt collective horror and sorrow over the 9/11 attacks, the failing economy, corporate confidence scandals, the looming war with Iraq... It's so bad that my first thought on learning of the Columbia disaster wasn't "how terrible" but instead, "It could've been worse." We see images of the booming 90's, the exultations of the bicentennial and VJ day, and can't even remember a time of such tremendous national confidence and exhilaration. We seem fixated of late – damned, if you will – to experience no national emotions other than shock, loss, and grief. Editorial cartoonists have the unenviable task of turning popular events, news, and opinions into visual media in a way unmet in photojournalism. The creations of illustrative media, emotional or otherwise, in good times or bad, is a daunting task with as many crass responses as laudable ones. The first editorial cartoon I remember is Doug Marlette's weeping bald eagle for the Charlotte Observer, a reaction to the destruction of the space shuttle Challenger (which I watched blow up after takeoff during my classroom birthday party, January 28, 1986). The image is fixed in my mind even now, as rich in pen and ink detail as video of the blasted debris and veering SRBs are from news coverage. In the days following 9/11, I watched the editorial response with great interest. Most gripping of all the touching illustrated commentaries was Jeff Stahler's cartoon published on September 14, 2001 in The Cincinnati Post. It powerfully combines the devastation and personal loss of the 9/11 attack communicated powerfully by an image of a cell phone lying amidst the rubble of the World Trade Center. But events of national disaster are not the only crises in which such an editorial response can be both powerful and insightful. Clay Bennett's editorial cartoon published October 8, 2001 in The Christian Science Monitor illustrates the American loss of innocence and peace of mind after the attack. In a period when we all waited for a second devastating act of terrorism, it well illustrated our anxiety and bittersweet nostalgia. But no contemporary discussion of the editorial cartoon medium would be complete without reference to that most recent tragedy, the loss of the space shuttle Columbia, or our region's most celebrated editorialist, Mike Luckovich. 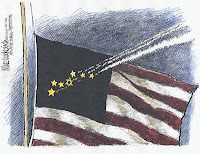 His weeping Statue of Liberty was inescapable after 9/11 and his response to the Columbia's loss was equally touching – shooting stars crossing the blue canton of the US flag, a sole star of David in their midst, touchingly remembered the loss of the shuttle crew and expressed our weeping national wound. What is the value of these expressions, or even the editorial cartoon as an effective communicative media? Certainly, for less emotive subjects the medium is well suited to caricature and humor. In a more serious and heartfelt vein, the medium can symbolically illustrate complex situations through simple depiction.